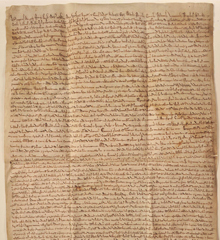 An original edition of the “Magna Carta,” and the only known example of the King’s Writ — a letter from King John to the Sheriff of Gloucester announcing the signing of the Magna Carta — is headed to Houston from its home in Hereford Cathedral. The loan of the documents was a partnership arrangement between the Houston Museum of Natural Science and the Chapter of Hereford Cathedral and Hereford Cathedral Perpetual Trust. Magna Carta was generously underwritten, in part, by The Hamill Foundation; The Harriet and Truett Latimer Endowment Fund; Dianne and George Lindahl; Kathrine G. McGovern; Kelly and Bill Montgomery; Elizabeth and Gary Petersen; HMW Entertainment; George and Mary Josephine Hamman Foundation; Tudor, Pickering, Holt & Co.; Vinson & Elkins LLP; Laurie and Reed Morian; and Lisa Young and Matt Assiff.